The Void’s hyper-reality experiences allow you to do more than just enter a new world–you get to touch, feel, interact, and even smell truly terrifying environments. I am screaming so loudly–repeatedly–that it’s more of a piercing shrill echo. I fear it’s so disturbingly distracting that I can’t stop apologizing. “I am so very sorry,” I tell my fellow time-travelers, noting that once again, the demon got the best of me. He came out of nowhere and as much as I tell myself this isn’t real, it feels real. This, despite the fact that whenever I bring my hands to muffle my mouth’s sounds, they do not appear as my hands; they are the thin, leather-gloved fingers of a Victorian lady. 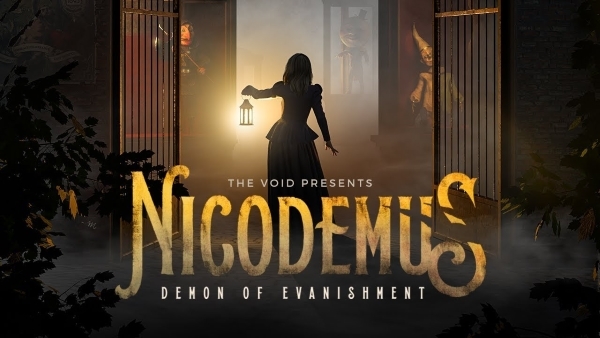 I am at Nicodemus: Demon of Evanishment, a new hyper-reality ghost tour presented by The Void, which produces immersive location-based VR experiences. In this new vision of the traditional haunted mansion, a group of four is hooked up to virtual reality headsets and jetpacks to set off into a maze of a dozen connected rooms that to the naked eye, resemble a laser tag playground. But for those equipped, we have traveled back to a detailed recreation of what was left of the forsaken Chicago World Fair in 1894. There, amidst tarnished wrought-iron gates and decaying spiderweb-strewn exhibits, one explores the ruins of what was once a grand expo center. Gilded Roman statues crumble before you as rats scuttle across the dirtied stone floors. Sometimes a rotting corpse makes an impromptu appearance, its curdling blood slowly dripping by its wayside. There’s also a more ominous element at play: A supernatural presence by the name of Nicodemus has somehow transported itself to the vacant grounds by way of an electro-spiritualism experiment gone wrong. The monstrous demon, whom I assume hates fairs, kidnaps fine folks such as my newfound pals. We board a rickety train that abruptly halts and shakes whenever the sinister spirit attacks, but in reality, we simply walk from room to room, grasping at blank black walls whenever we need to steady ourselves. Every so often, our expertise is commanded, such as when electricity valves need a surge or a chilling exhibit requires a lever pulled. It’s truly an interactive haunted experience, albeit more sophisticated than your average Halloween hayride. Halfway through our 20-minute tour, one of my fellow explorers excuses herself. Not because of anything I’ve done or how long I’ve screamed, but because this hyper-reality ghost experience proves too much for her. Virtual reality quickly tightened that gap, with various companies attempting to make a murderous spree reenactment seem all the more terrifyingly real. In 2016, the Los Angeles coworking space Ctrl Collective built numerous room-size horror VR environments, which saw more than 1,500 visitors. Likewise, Knott’s Berry Farm in Southern California admitted “patients” into a virtual reality psychiatric hospital where a demonically possessed killer was on the loose. They were, of course, strapped into a wheelchair. They were all part of the burgeoning VR industry, which at its current growth rate, is expected to surge to $101 billion by 2027 as industry giants such as Microsoft, Google, and Facebook expand its reach to further categories. The Void takes the idea of horror VR one step further by building elaborate, physically connected sets that allow users to actually walk, touch, and even smell the environment. Patrons do not simply sit there with a headset on; they are encouraged to interact with the set. The games are meant to be social: Participants cram together during attacks or work with one another to solve puzzles. You’ll hear players shout to each other, “Watch out!” or “Come stand by me, it’s safer.” Everyone, quite politely, tries to help the other survive. Designers use a medley of illusionist tricks, including redirected walking elements, to take an initial group of strangers and have them high-fiving in unity by the end of the course. Tracy Hickman, NYT bestselling fantasy author and the head of story for The Void, sees no better way to unite people: “Horror is a universal thing,” he says. The Void is currently available in eight centers across the U.S., with nine more to open in the coming months. The 20-minute tours range from $29.95-$36.95 depending on location and peak times. Most of the locations are centered around shopping malls, or high-traffic areas like The Venetian in Las Vegas. In addition to Nicodemus: Demon of Evanishment, The Void also offers Ghostbusters: Dimension, which lets users live out their Ghostbusters fantasies in an abandoned historic New York City hotel. Narrated by Dan Ackroyd, the Ghostbusters edition is more fun than scary. You’re armed with a proton gun and get to shoot at stuff–not just neon bright ghosts and Slimer, but furniture, paintings, dishes, and well, just about anything. There are a few nostalgic surprises in reference to the movies, but overall, it’s far more kid-friendly than the demon stuck in a Chicago wasteland. The Void, a graduate of the Disney Accelerator incubator, is no stranger to mainstream blockbusters, having set a slate of Disney-related films after having collaborated with Disney’s ILMxLab on a Star Wars attraction last year. Cofounder and CCO Curtis Hickman (son of fantasy author Tracy Hickman, who also helped design Nicodemus) tells Fast Company the three-year-old startup tries to keep a delicate balance between franchise collaborations and original content. The latter, he says, often plays stronger with audiences since it transports them to an entirely new world with no preconceived notions or expectations. “Discovering a new reality is a big part of what we’re trying to provide at The Void,” says Hickman, who is himself a professional illusionist. Hickman often draws from his own curious (and morbid) interests. His work often features Gothic architecture, dimly-lit alleyways, and what more or less looks like a Jack the Ripper set. He seems to dig dark stuff that’s designed well. The real achievement lies in the detail of recreating the historic event, from the exhibit’s creepy cymbal-banging monkeys to the swaying lily pads in the water. Every bit of furniture or accessory is accentuated with markings, signs of wear, or colored threading. Meanwhile, interactive elements are hidden throughout, inviting one to suss them out and explore their outcome. That includes Easter eggs and alternate endings, which are built into the ride. To that end, The Void offers visitors a short novella about Nicodemus, tied in a faux-leather bound booklet. Clues are strewn throughout the story as well as valuable information like say, how not to die. (Spoiler alert: I did not survive the ride.) It gives you an “edge” over fellow attendees. “We tried to design Nicodemus in more of a meta-structure than just the experience itself,” says Tracy Hickman. For the father-son duo, such painstaking dedication to the finer elements (Nicodemus took nine months to conceive and produce) is at the heart of their attempt to redefine VR. Too often, says Curtis Hickman, competitors focus on the technology instead of the ultimate experience. It shouldn’t be about the fanciest headset; it should be about stepping into another world. The Void’s mission, therefore, is “how can we make virtual reality more like promise of VR and less like what it became to be,” says the CCO. On the content-production front, the company plans to stick with action-packed series and horror for the foreseeable future, but also hopes to dip its toes into alternative education. “What’s it like to go to historical places or be in amazing events throughout history?” he wonders. The creators admittedly develop worlds that they themselves want a thrill out of. Although they perhaps never exercised their lungs quite as I did, they are not shielded from the demon’s terror. They, too, get a little spooked.